The end of the Gregorian year is almost upon us. This week brings us the last Shabbat of 2012. Although we mark sacred time using the Jewish calendar rather than the Gregorian one, the turn of the Gregorian year offers us an opportunity for reflection just as the turn of the Jewish year does. Sometimes in our Friday morning meditation minyan I lead us through remembering each of the days in the week which is about to end. Sunday: what did Sunday bring to you? Monday: what were its challenges, what were its gifts? Tuesday? Wednesday? And so on, until we reach the present moment, Shabbat about to arise. The same exercise can be done as a reflection on a whole year. Think back on 2012: where were you, a year ago? What do you remember of January — what were its challenges, and what were its blessings? What sticks with you from February of this year? From March? April, May, June? July, August, September? October? November? This month of December which now draws to its close? I hope that CBI figures in some of your sweet memories of the year now ending. And I hope that when you recall the challenges and stresses of 2012, you also have memories of how the CBI community helped you through. Please join me in setting the intention of making 2013 a wonderful year for our congregational community. May we each be blessed with connections and with a sense of community. May we be here for one another in our joys and in our sorrows. May we pray together, learn together, dine together, say kaddish together, laugh together, make blessings together. I wish all of y’all a sweet final Shabbat of 2012 as we approach the new Gregorian / secular year! May 2013 be a year of blessing, good health, and joy for all. At the beginning of today’s Torah portion, Pharaoh dreams two dreams. First, seven handsome cows arise, and seven lean cows devour them. Then seven fat ears of corn arise, and seven lean ears devour them. None of Pharaoh’s soothsayers can interpret these troubling visions. Fortunately, Pharaoh’s cupbearer remembers that when he was in jail a few years back, he met an Israelite named Joseph. Pharaoh summons Joseph and says, I hear you can interpret dreams. But Joseph demurs. “Not I, but God.” Joseph doesn’t have the answers; God does. But Joseph can serve as a channel, opening himself to allow God’s insight to flow through. It’s December in the modern world, and the commercials with which we are deluged remind me of Pharaoh’s dreams. Every time my television tells me that if I really loved my spouse I would surprise him on Christmas morning with an expensive car, or diamonds, or electronics, or new clothes, I think of Pharaoh’s sleek fattened cows. Richness. Abundance. That’s the dream the television is selling. The new lunar month of Tevet begins on Friday, so here’s a new Song for the Month of Tevet, which we’ll sing at Shabbat services this week. Awaken, arise to the wholeness of your being! Awaken, arise to the beauty of your soul! I thought it would be a nice prayer to have in our heads and our hearts (and on our lips!) as we approach the winter solstice and begin the slowly brightening days which will follow. 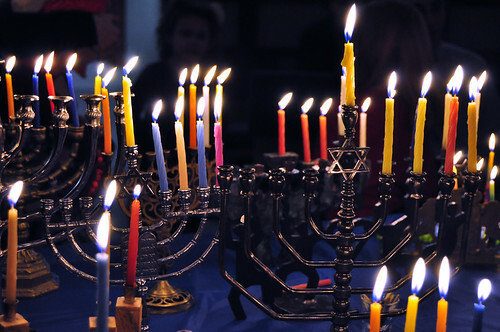 Come celebrate Chanukah (and Shabbat) at CBI! Join us on Friday, December 14, at 5:30pm at CBI for a Shabbat-and-Chanukah celebration and potluck! Bring: a vegetarian/dairy dish to share, and your chanukiyah and candles. We’ll light all of our chaniukyot together in the sanctuary, sing the blessings, and sing a few favorite Chanukah songs. We’ll round out the evening with hanging-out, schmoozing, and many games of dreidl. Chag sameach / happy holiday to all! Also, here is a pdf of a flyer about the “Art of Giving” program at Concepts of Art / Lenox Judaica. If you shop at that store (65 Church Street in Lenox, or online), they’ll give 18% of your purchase price back to CBI as a donation. This applies to all items except paintings by Karla Gudeon and consignment pieces. You can read a little bit about how this podcast came to be in the post Beginning a Torah podcast…with my students. The Joseph novella is one of the richest stories in Torah. We read it every year as we approach the darkest days of winter. I like to teach it as a narrative about descent for the sake of ascent. What goes up, in other words, has to start out by going down. But rabbinic opinions and teachings about Torah are a dime a dozen. How might the next generation of young minds understand this story? What implications might they tease out through a combination of bibliodrama, midrash, and improvisational theatre? Enter the CBI Ne’arim Podcast. Act one: the Torah story, narrated by the students in their own words. Act two: a taste of bibliodrama. We’ll hear segments of an interview with the Biblical characters. Act three: going further afield. What if the Joseph story took place in outer space, or featured modern political personalities, or happened on a planet full of nothing but cows? Our young scholars will take us into some of these possible realities. Act four: epilogue. A roundtable conversation with the students. What was this journey like for them? What, if anything, did they learn? Do they experience the Joseph story differently now than they did before? My thanks are due to the Ne’arim students for entering into this adventure with such enthusiasm. I hope y’all enjoy! I just received an invitation for teen members of the CBI community to attend a workshop put on by the Temple Israel Greenfield Hebrew School and the Greenfield Chapter of Hadassah. What was the Kosher Meat Boycott and What Does It Have to Do with Me? It’s free and open to any interested teens, regardless of affiliation or level of Jewish education. (Also regardless of whether or not the teen has ever kept kosher!) They will do some interactive exploration of ideas about work and time related to the Labor Movement, learn some American Jewish history together, and read selections from sacred texts which help to provide the backbone of the Jewish ethics related to specific historic events and the Jewish participation in them. They will then study and discuss contemporary events, and will brainstorm possible projects stemming from the teens’ interests. This is an opportunity for western Massachusetts Jewish teens to meet each other and study and discuss these issues together. It’s a chance for these teens to meet one another and to talk about important issues which matter to them. And it’s also an opportunity for them to develop their ideas and understanding of shared community ethics, and to think about what they can do to make the world a better place. This program is ideal for teens post bar and bat mitzvah who are looking to expand their interest in tzedakah (righteous giving) and tikkun olam (healing the world). I think it’s appropriate for those who are becoming b’nei mitzvah this year, too. This will be the first in a series of social justice workshops where teens will have the opportunity to study American Jewish history in social activism, and then to look at what interests them today and what are related problems they would like to tackle. I would love for some of CBI’s kids to attend. I’ve sent a flyer to the parents of our teens — if you didn’t receive it, let me know and I will send you another! Please share this with your child(ren) and consider whether they might be willing and able to attend. We can arrange carpooling if that’s helpful.